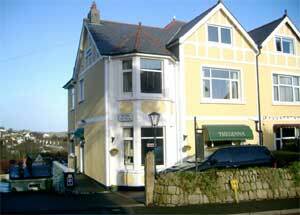 Tregenna Guest House is a small guest house in Falmouth, half way between the town, local beaches, docks and busy harbour. All six guest rooms are comfortable, cosy and situated on the first and second floors. Each of the room also boast terrific harbour or sea views and are maintained to the highest of standards, catering for individuals and families alike. At the back of the property there is large sun-terrace , an ideal place to relax, forget the worries of work and idly regard the harbour. Please be advised that smoking is not permitted inside the house but is allowed on the terrace outside.